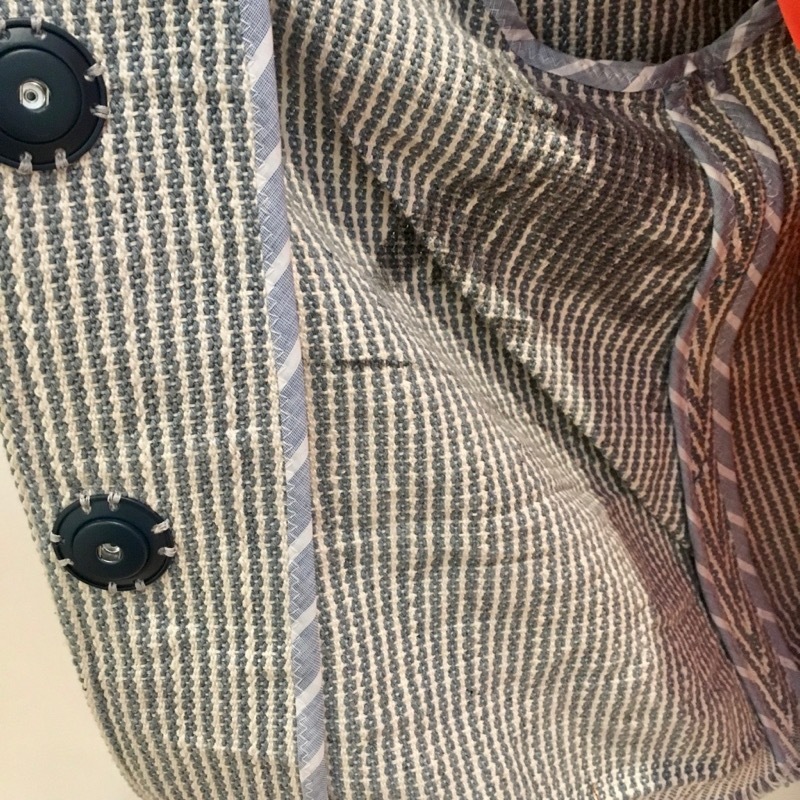 This blog post title is quite a mouthful but the "fabric" I used has such a great origin story that I didn't want it to get lost in view of the final jacket. It all started last summer, when I found out that a local coffee roasters here in London had partnered up with a Guatemalan company to reuse waste cotton fibres leftover from the denim industry. They mix the waste denim in with a small amount of virgin, undyed cotton, and produce fabric on giant looms which they turn into coffee sacks. These are then filled with local beans and shipped all over the world, and after the coffee beans are off-loaded, you can buy the recycled denim sacks to reuse however you'd like. 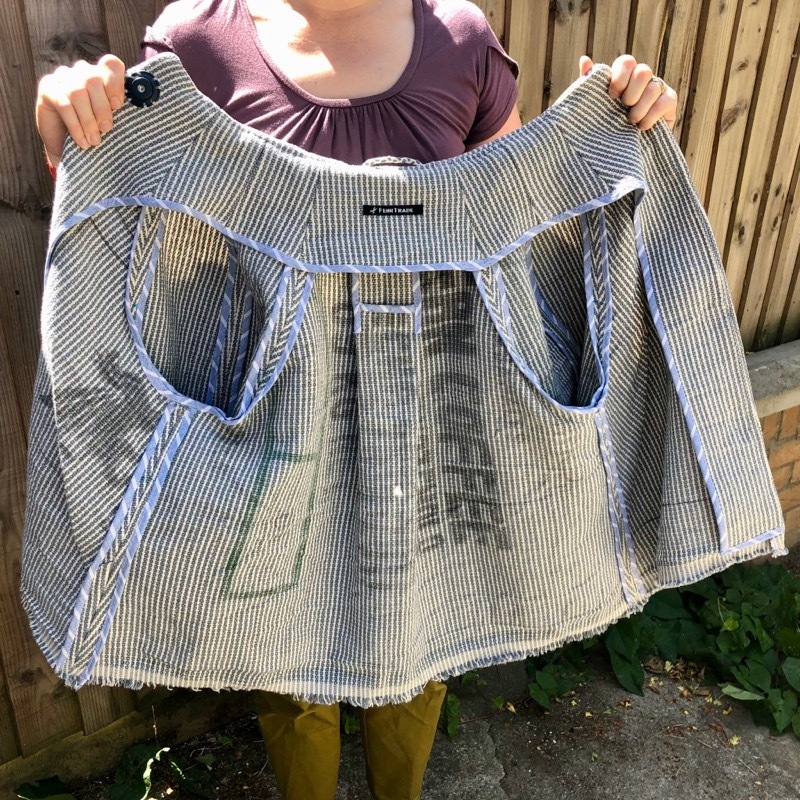 There's a lot more about the super-interesting process over on Square Mile Coffee's blog, but as soon as I heard about it, I instantly bought two sacks with the idea that I'd make myself a pair of jeans with it. But when they arrived, I realised that, while the original fibres were denim, the recycled sacks were more like a cotton bouclé, and far too loosely woven to be used in place of denim. So I pre-washed the sacks, dutifully unpicked all the seams, and thought about making a jacket while the seasons rolled around to something more befitting an unlined jacket (since I knew I didn't want to cover up the cool coffee sack printing!). 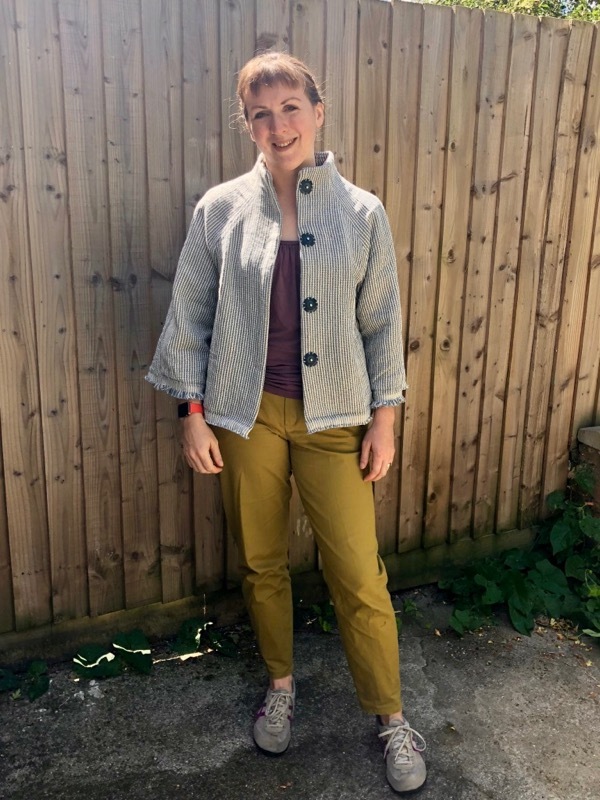 A couple of candidate jacket patterns caught my attention, but then I saw New Look 6532 as a free covermount pattern on Sew Magazine and thought it was pretty much exactly what I had been imagining for my coffee sacks. 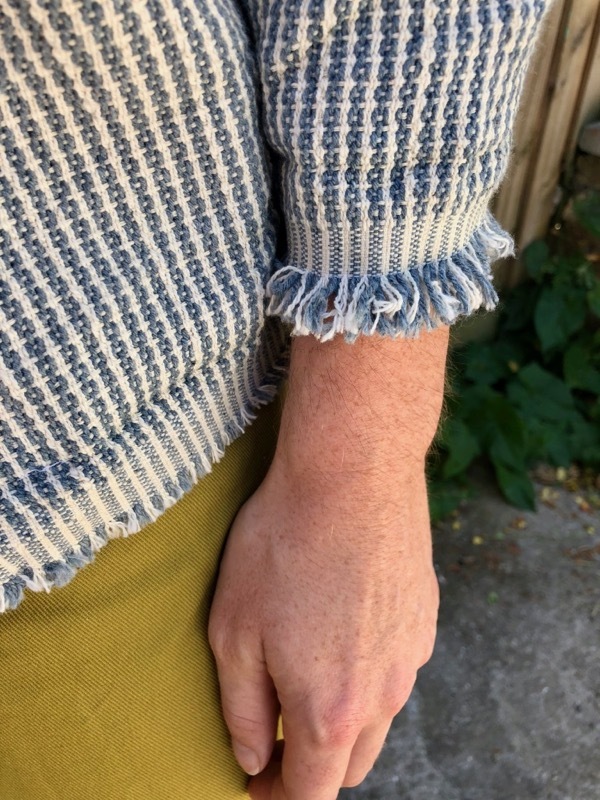 This blog post title is quite a mouthful but the “fabric” I used has such a great origin story that I didn’t want it to get lost in view of the final jacket. It all started last summer, when I found out that a local coffee roasters here in London had partnered up with a Guatemalan company to reuse waste cotton fibres leftover from the denim industry. They mix the waste denim in with a small amount of virgin, undyed cotton, and produce fabric on giant looms which they turn into coffee sacks. These are then filled with local beans and shipped all over the world, and after the coffee beans are off-loaded, you can buy the recycled denim sacks to reuse however you’d like. 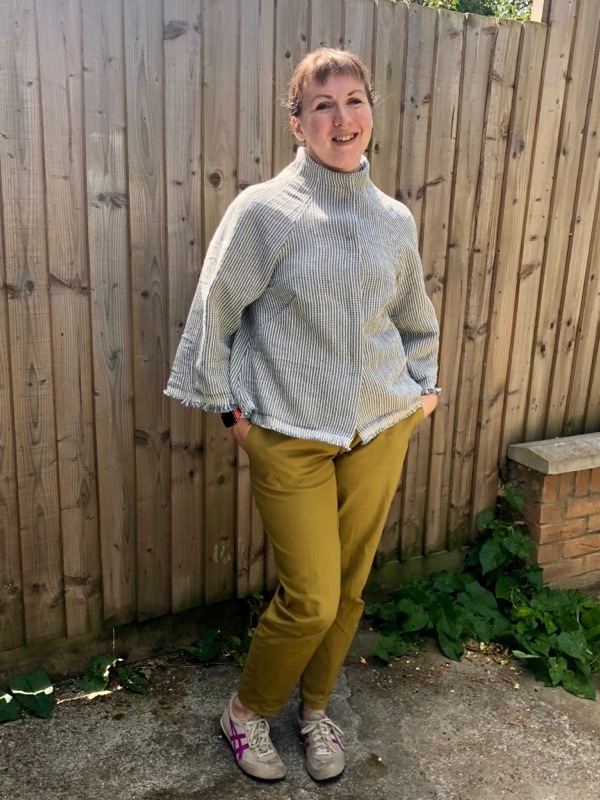 There’s a lot more about the super-interesting process over on Square Mile Coffee’s blog, but as soon as I heard about it, I instantly bought two sacks with the idea that I’d make myself a pair of jeans with it. But when they arrived, I realised that, while the original fibres were denim, the recycled sacks were more like a cotton bouclé, and far too loosely woven to be used in place of denim. So I pre-washed the sacks, dutifully unpicked all the seams, and thought about making a jacket while the seasons rolled around to something more befitting an unlined jacket (since I knew I didn’t want to cover up the cool coffee sack printing!). 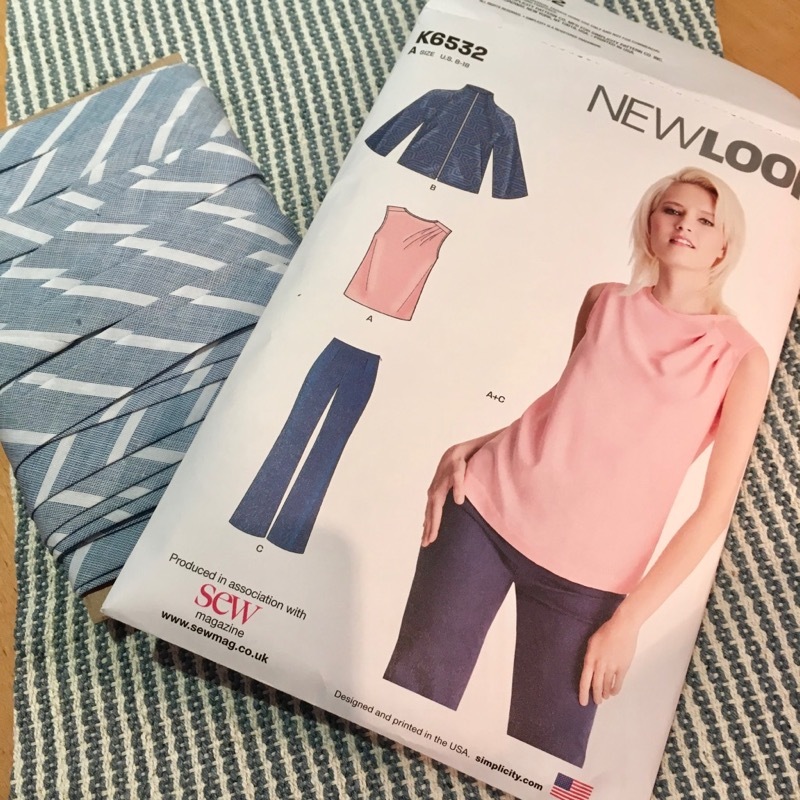 A couple of candidate jacket patterns caught my attention, but then I saw New Look 6532 as a free covermount pattern on Sew Magazine and thought it was pretty much exactly what I had been imagining for my coffee sacks. 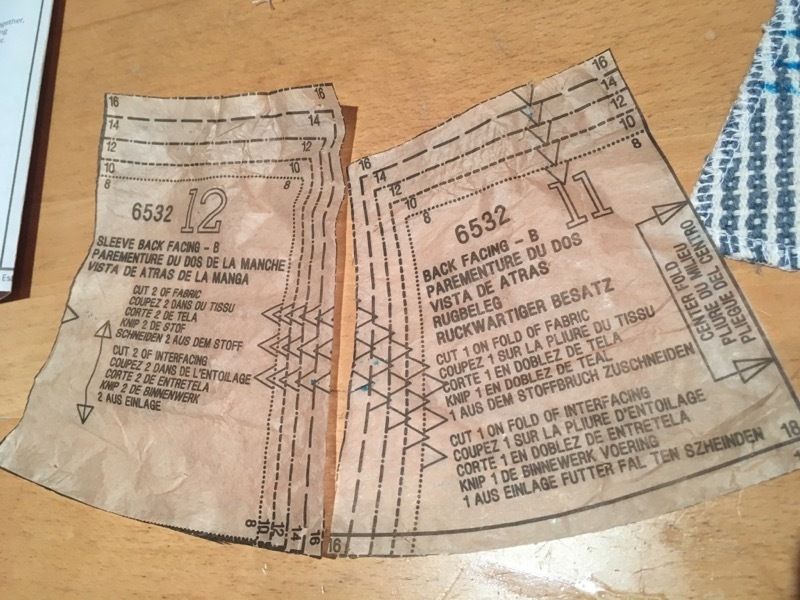 Now, I don’t often sew with Big Four patterns these days, maybe only once or twice a year, and I’m reminded why – a good 75% of the time I find drafting errors in them. 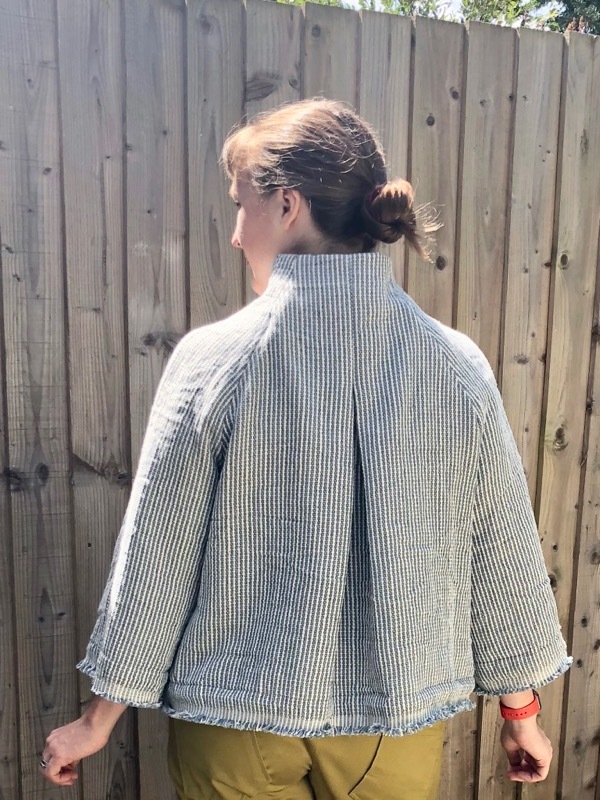 Usually it’s “just” mismatched notches or untrued seams, but this pattern has a doozy – the Back Facing (piece 11) is too short for ALL the sizes. And of course I didn’t discover it until I’d cut, overlocked all the edges (to prevent unravelling), and interfaced it. Grrrrrrr. After I’d fixed the pattern piece so that it was equal in height to the other facing pieces, I had a helluva time finding a piece of my offcuts big enough to piece it from, but eventually I made it work. 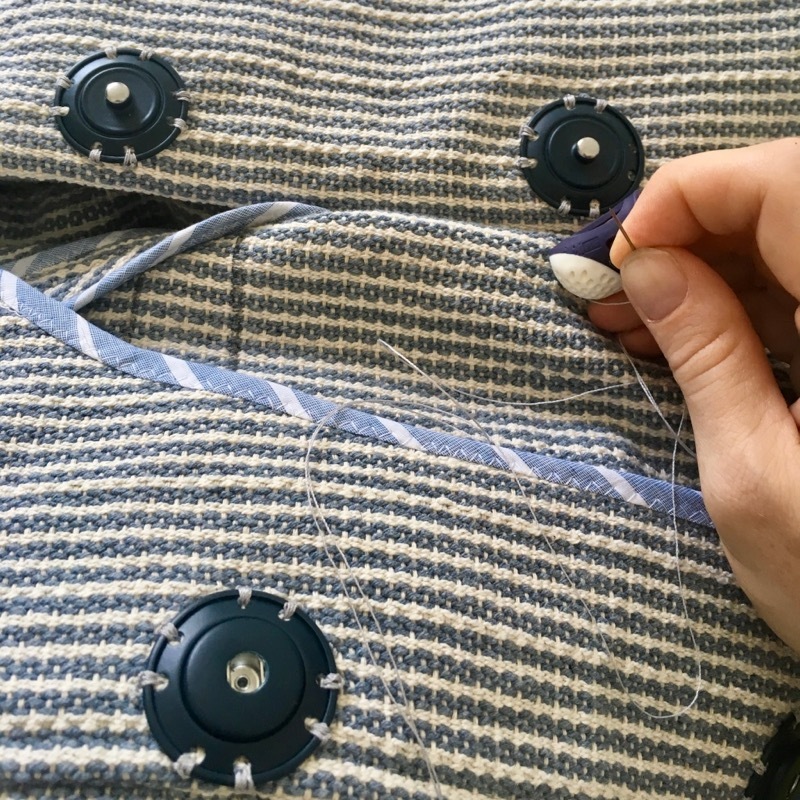 Since this fabric was so loosely woven and I knew I wanted to keep the jacket unlined, I set out to make my own bias binding from a metre of blue and white striped cotton shirting (originally from my Sewing Weekender goodie bag last year, I believe). It was a completely separate weekend project just to cut, join, and press the binding, but it meant that by the time I was ready to sew my jacket, that part was already done. Note to future Melissa: one metre of fabric makes a LOT of binding! 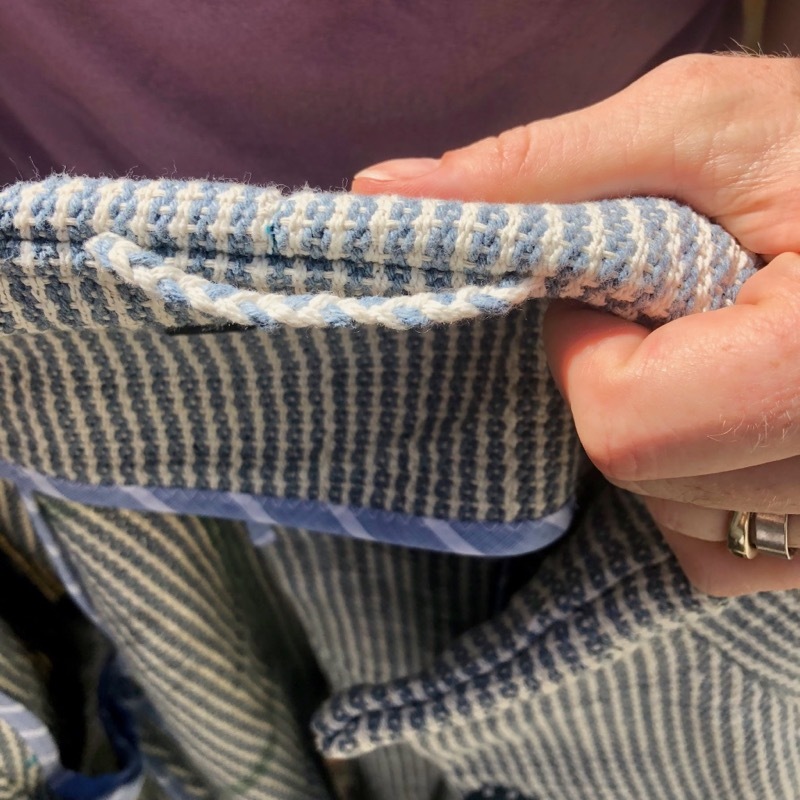 After cutting each piece, I overlocked the edges to keep them from fraying, and then after sewing each seam, I bound the seam allowances in the striped bias binding. 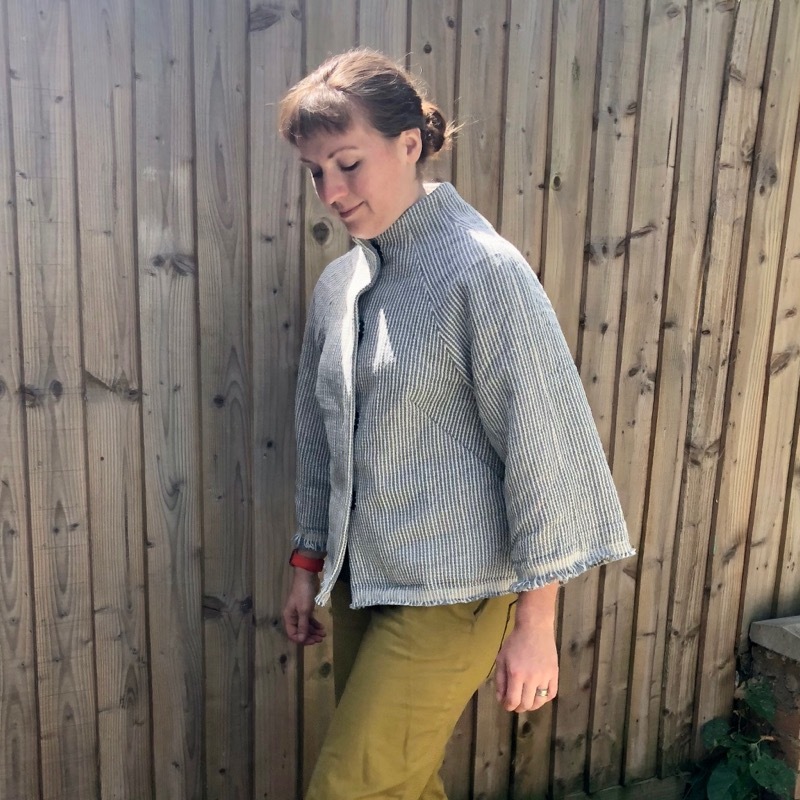 I hadn’t planned on topstitching the seam allowances down, but it really helped to cut down on bulk and the bouclé really hides the stitching anyway so it totally made for a much more comfortable jacket! Even with the drafting error, I think this is a really nicely shaped jacket. 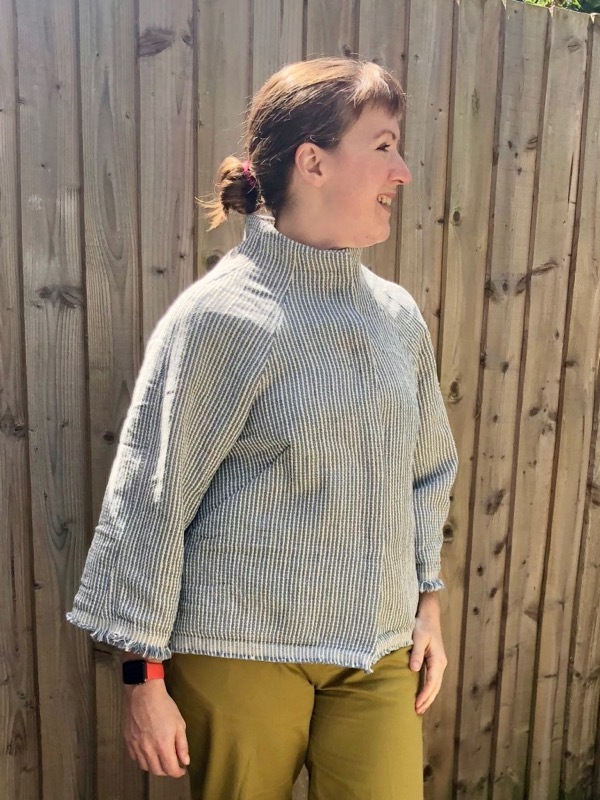 The raglan sleeves are really beautifully curved and I love the high funnel neck and the wider hem on the (cropped) sleeves, too. There’s a big box pleat in the upper back which gives you a lot of room at the hem and reminds me a bit of those 1950s swing jackets. The jacket is meant to just be open, but I knew I wanted to add some sort of closure. 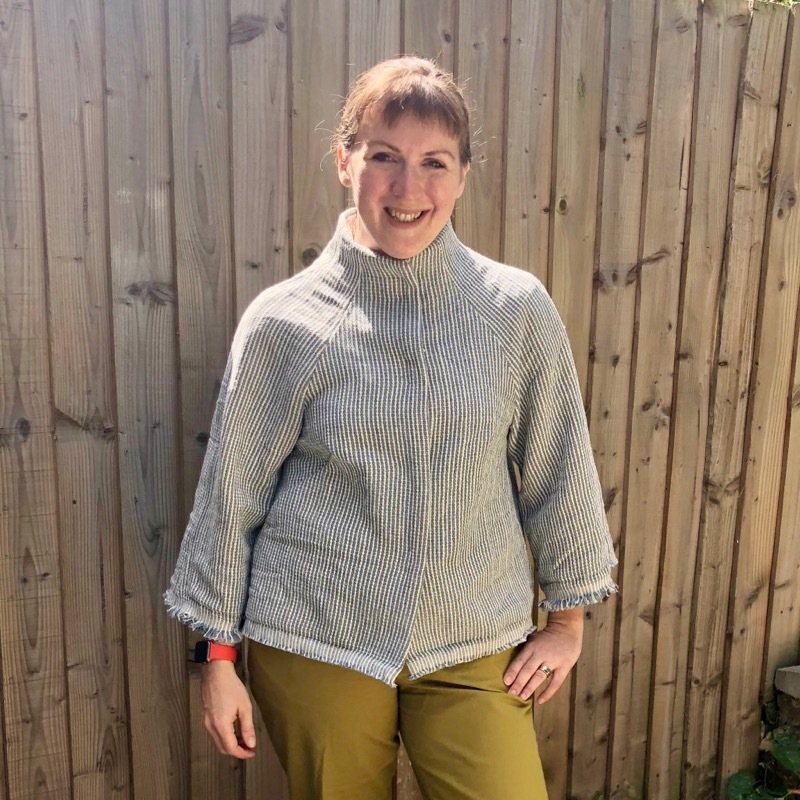 I toyed with the idea of adding tabs and hidden snaps, but when I pinned them it place, it made it look a bit too “Gulag prison uniform”, and as it turned out, there was ample room for me to overlap the fronts (even at the neck!) so I could just add a conventional closure. 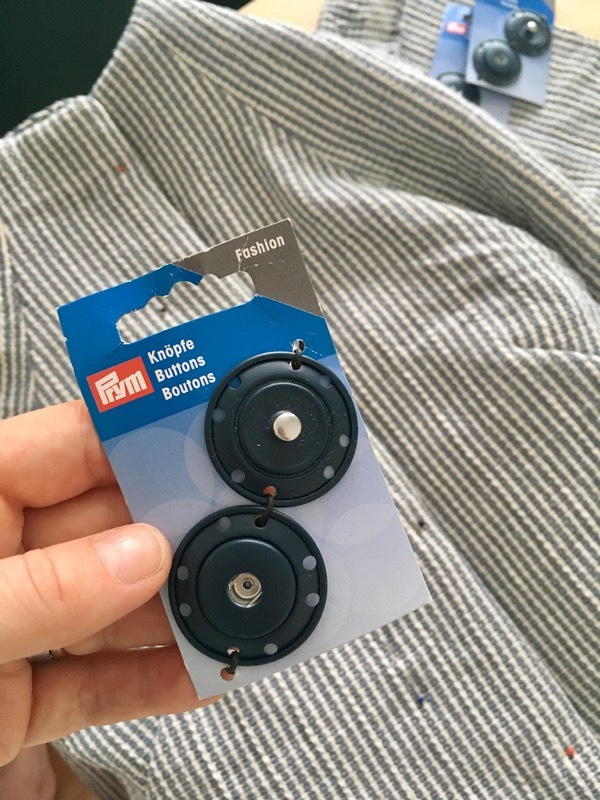 Luckily for me, I had a rummage in my haberdashery stash and found The Most Perfect oversized snaps! I swear, even the shade of navy compliments the denim bouclé so it was clearly meant to be! I’m not a natural fan of hand stitching, but I took my time to make it neat and I managed to sew all four snaps in over two evenings, and I can’t imagine the jacket without them now. 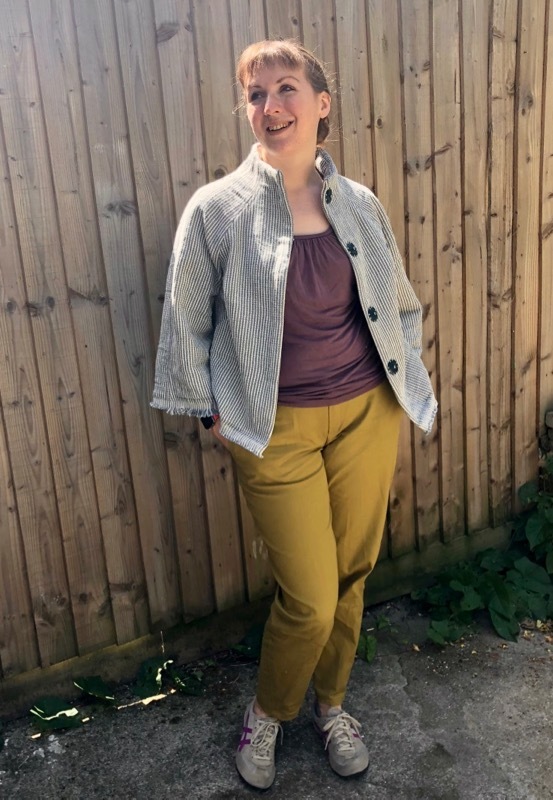 I actually finished this jacket during my staycation a few weeks ago, but it’s been SO HOT in London for months on end that I couldn’t face wearing it long enough to take photos. But then we had some storms which brought the temperatures down a bit, meaning I could not only model it but also wear it into town For Real this weekend! 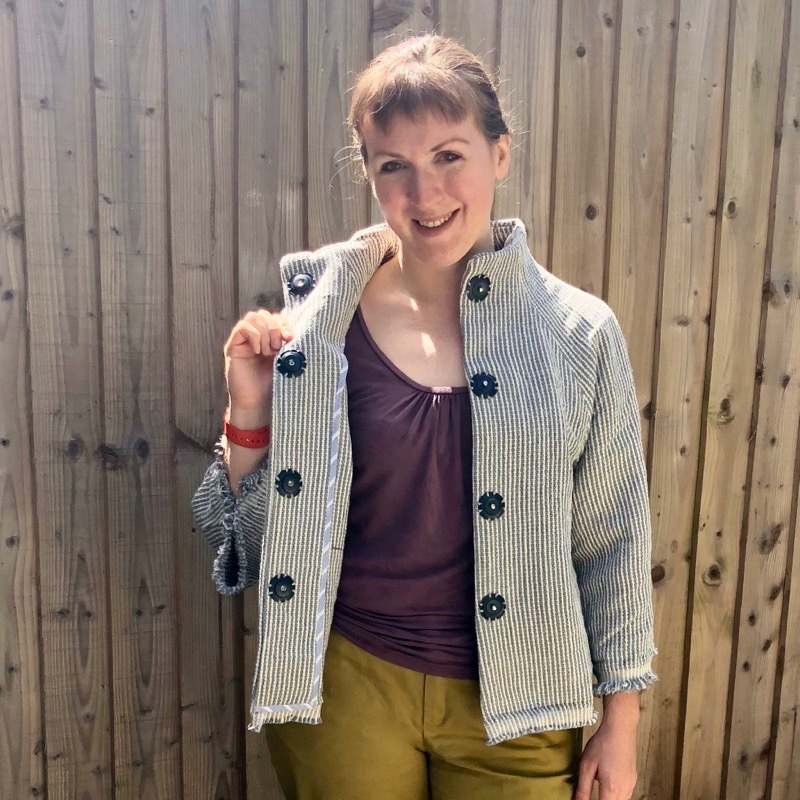 I thought I’d miss not having pockets, but as it turns out I usually have some in my trousers or a separate bag anyhow, and I love everything about this jacket now it’s finished. I even unpicked some yarns from my scraps and braided them to create the hanging loop! I’m really proud of the level of thought and detail that went into this jacket, from the people in Guatamala recycling denim waste, to the people at Square Mile Roasters shipping their coffee in recycled textiles and then selling them on for others uses, to my own care to making sure I made a robust and beautiful jacket worthy of its origins. I realise that this post may cause Square Mile to sell out of bags, but do be patient as they only have as many bags as they’ve had coffee bean shipments, and it’s worth waiting for them to restock! Separator image Posted in Gallery and tagged with jacket, new-look, recycled. Love it…and have ordered my sacks! that is so nice, love the pattern and shape. looks great on you. And you must have back luck with patterns from the big 4 as I sew loads of them and find almost no errors. This is an awesome jacket and what a great initiative by the coffee roasters! That’s a cute jacket! I think the combination of the denim fabric with that pattern is fantastic and I love the fringed selvedges. Sorely tempted to get some denim too, but I went fabric shopping at the weekend and I’ve already topped up the stash for the time being. But, then, I do need a denim jacket……. Well that takes recycling to a whole new level! What a great pattern to get as a freebie too (apart from that facing error, how very odd! ), I love the collar of the jacket. What a cute jacket, with a great backstory! And I love those giant snaps, they are perfect.